MousePlanet Park Guide - Walt Disney World - Fantasmic! Walt Disney World's edition of Fantasmic! opened in October 1998, six-and-a-half years after it debuted at Disneyland. It continues to be extremely popular and long lines to get into the Hollywood Hills Amphitheater are most often the case. The show is a journey through Mickey Mouse's imagination and showcases various Disney animated movies, and takes place on an island surrounded by a 1.9-million-gallon moat. The show is truly multimedia using film projected onto water-mist screens, fireworks, live characters on barges and other suprises. While most people prefer the version of the show at Disneyland, it is certainly more comfortable to sit in the amphitheater seats here in Florida than it is to camp out on the walkways in California. Good sightlines are to be had from most seats. There is also a large standing-room area, but viewing there may be difficult if there are tall people in front of you. Location: The show takes place in the Hollywood Hills Amphitheater near the end of Sunset Boulevard, across from the Sunset Ranch food court area. Capacity: The Hollywood Hills Amphitheater seats 6,900 people. It also can accommodate up to 3,000 more standing viewers. Characters: Just about every costumed Disney character shows up in the show at some point or another, with a cast of 50 performers. Wait Times: Crowds vary by season and show time. Later shows usually are much easier to get into. During the busy season, crowds may start lining up as much as an hour or more before show time. For the early show, many people will get food from the Sunset Ranch Market across Sunset Boulevard and eat their dinner while waiting in line. In low season, it is quite possible to walk in just before the show and still find a seat. 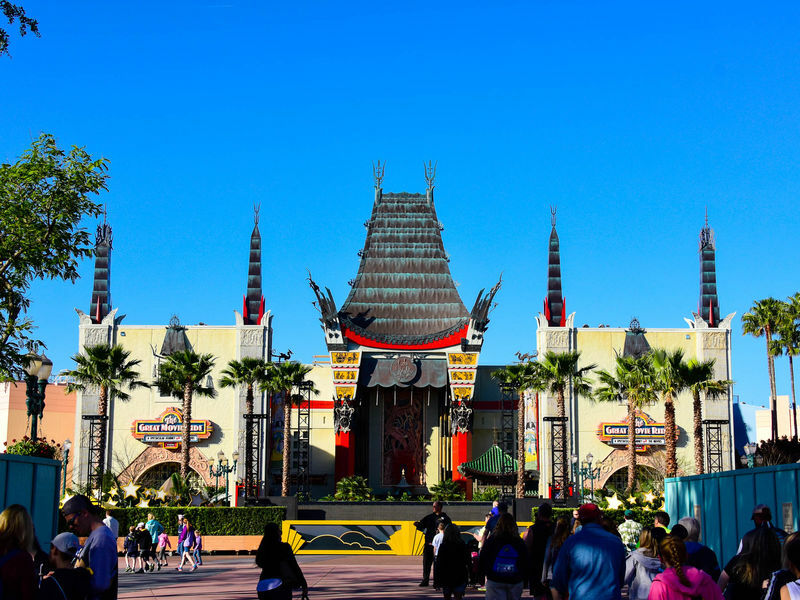 Queue Description: A plain, wide walkway from Sunset Boulevard down to the Hollywood Hills Amphitheater. There is really no seating in the walkway, which may be bothersome if you are in line an hour before show time, as the line does not move until the floodgates open and everybody files into the amphitheater. Ride Access: Seating is on backless benches on a tiered slope, similar to most theaters. Entry is from behind the top row. Wheelchairs and ECVs will be directed to park behind the top row of seats by cast members. The main exit is through a backstage pathway behind Sunset Boulevard that lets you out next to Oscar's Service Station by the main entrance to the park. Audio: Assistive listening devices are available from Guest Services. Reflective captioning devices are available from hosts/hostesses in the amphitheater. Other Issues: Should be none, other than boredom if camping out in line for a long period. Fireworks and loud noises figure prominently and may scare some young children. At this location: The Hollywood Hills Amphitheater was built specifically for Fantasmic after it proved to be such a hit at Disneyland. 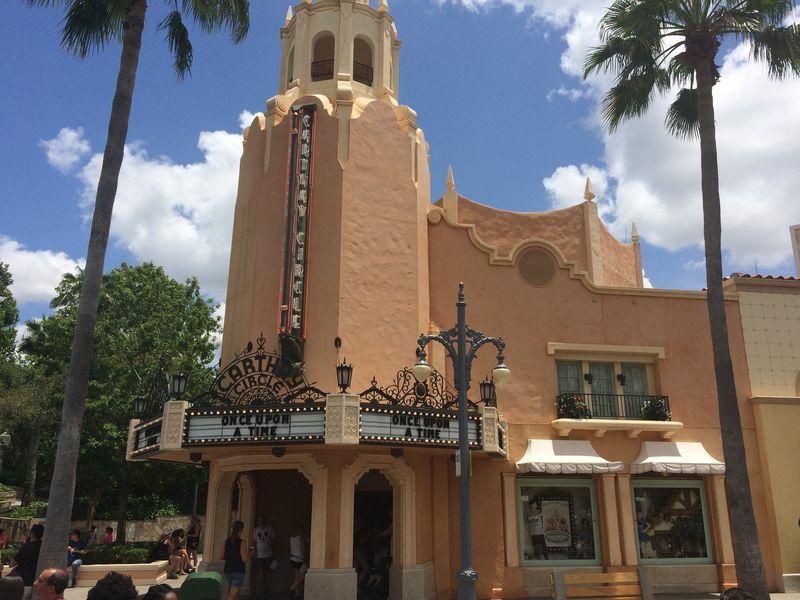 This attraction's history: After opening to high acclaim at Disneyland in May of 1992, Walt Disney World decided that it would make a great addition to the Disney's Hollywood Studios. Duplicating the show from California would have been difficult, as the Rivers of America, the Mark Twain, the Sailing Ship Columbia and the rafts to Tom Sawyer Island are in use all day at Disneyland, and merely require a little retheming for the show. To build all of that from scratch for one or two shows a night would not have been cost-efficient. It was decided to build a smaller, taller island and to replace the Peter Pan sequence that required the Columbia with a scene based on Pocahontas, which at the time the show was being created had not yet been released. The scene utilizes canoes and the mostly takes place on the island. The Mark Twain was replaced by a much smaller vessel resembling the boat from Steamboat Willie. The small boat in the large arena has nowhere near the emotional impact of the Mark Twain steaming around the Rivers of America.